To ensure overseas mail can be handled and delivered correctly, the forms should be completed in English or a language which is accepted in the destination. Sender's full name, address and telephone no. / fax no. must be completed. Addressee's full name, address, including the country of destination, city, postal code, telephone no. / fax no. must be completed. Please tick the appropriate box specifying the category of item. Please give a detailed description, quantity and unit of measurement for each article (eg:1 electrical toy car (with 2 pieces of AA batteries detached), 3pieces of cotton shirt for men). Senders of commercial items, if known, please indicate the HS tariff number (which must be based on the Harmonized Commodity Description and Coding System developed by the World Customs Organization) and the country where the goods originated (including production, manufacture or assembly). Please indicate the net weight of each article (in kg). Please indicate the total weight of the item (in kg). Please give the declared value of each article, indicating the currency used (the declared value must be the same as that in the invoice or else it may delay customs clearance). Please give the total value of the item, indicating the currency used. Please complete the number of certificates and invoices attached. Please indicate clearly whether or not Speedpost Insurance is required for the shipments. Please enter the date and sign. 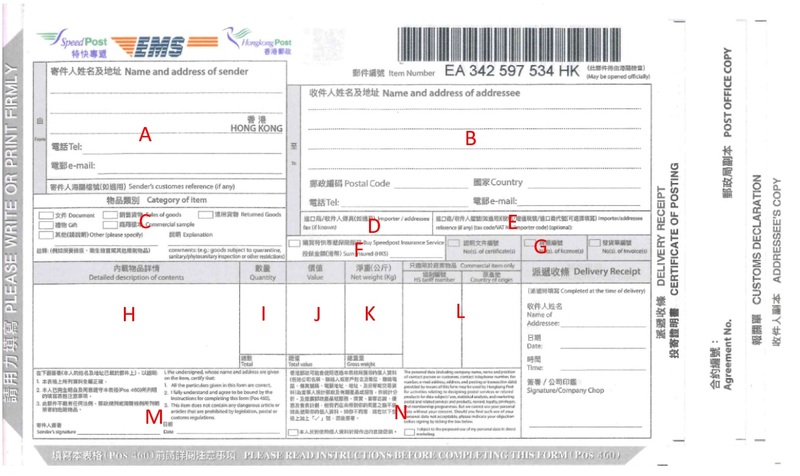 The personal data you provide in the address pack will be used by Hongkong Post for processing the posting. The information may also be used for the product promotion and analysis which are offered by Hongkong Post or other organisations which have a business relationship with Hongkong Post. If such information do not wish to be so used, please " " the box.